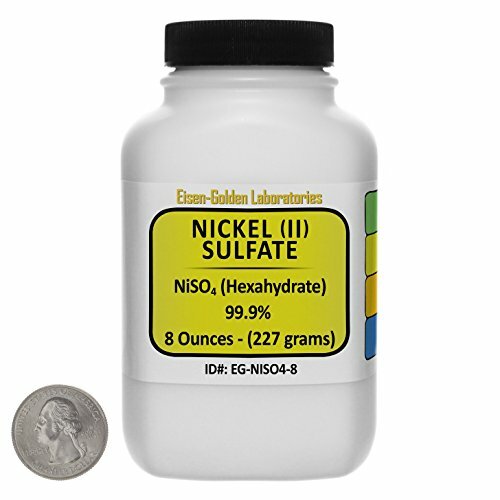 You are buying 8 Ounces (by weight) of Nickel Sulfate. The item ships in an 8 Fluid Ounce (by volume) Polypropylene bottle. Nickel Sulfate Hexahydrate (NiSO4); also known as / Nickelous Sulfate / Nickel (II) Sulfate; has hundreds of uses. SHIPS FAST FROM CALIFORNIA, USA! 2-4 day transit time throughout the country. We ship three times a day; so your item is guaranteed to go out the very same day you place your order. Our bottles are made of sturdy polypropylene. The square, "space-saver" shape ensures that the bottles fit snugly on a shelf. The wide mouth makes for easy dispensing and stackability. To ensure a spill-free journey, we shrink-wrap the screw tops and seal the bottles in plastic. If you have any questions about this product by Eisen-Golden Laboratories, contact us by completing and submitting the form below. If you are looking for a specif part number, please include it with your message.